Good article. Too bad the elementary school kids are spamming your comments section. Yeah, they seem to have glommed on here for some reason. You really should stop sniffing the glue. We really need to get a more powerful and sensitive ground penetrating radar orbiting Mars. The Mars Express has done a great job doing some of that but lacks the resolution or sensitivity required to map out the extent of lava tubes, caves or subsurface glacial deposits or aquafirs. The ideal sufsurface glacier or aquafir might be located above or near a volcanic hot spot? This where one might expect to find liquid streams or rivers flowing between the ices and bedrock? But seriously.. lets go back to the moon first to learn how to live under similar conditions? At the same time lets continue to send orbiters and landers to Mars to prepare for our eventual arrival. In doing so, we need to be ABSOLUTELY CERTAIN not to contaminate Mars. Think of the Passenger Pigeon? Another options would the cave-dweller approach. Use the existing terrain as the ancients once housed themselves for community benefits and against the elements. Perhaps there are caverns? I make a city on Mars in my short story, “The Mons Genius.” It’s fun to speculate what a thriving settlement and futuristic city could look like. The possibility of living underground is mentioned in the last section. But it wouldn’t require caves, we could use lava flows and dig our own tunnels. I love science and space exploration and grew up wanting to be an astronaut and aerospace engineer, but I’m confused about why so many people believe that Mars can or should be colonized. Regardless of what terraforming processes we envision, Mars has no magnetosphere and thus no way to hold onto an atmosphere over the long haul, not to mention the *permanent* problem of surface radiation. Are we really going to Mars en masse just to live like gophers? If that’s such a great option, then why aren’t population stresses forcing people underground here on Earth? I don’t see caravans of people headed towards our highest, driest, coldest deserts in the name of scientific exploration and/or real estate, yet our deserts come standard with an oxygen atmosphere and at least moderate radiation protection. I suspect that a big part of the Mars colonizers are people that wish to escape the “doomed” Earth and start their own new civilization on Mars; after all, there’s no difference in exploring Mars than in exploring Earth’s deserts other than a few billion miles of space travel; you’ll certainly achieve more discoveries in an Earth desert. The underlying assumption may be that Mars people could do things better the 2nd time around. That idea is bunk. If Homo sapiens can’t learn to live on Earth, the ecosystem and context they are evolved for, they certainly won’t learn to live anywhere in the Universe; not if nation-states and industrial market economics have anything to do with it. Another problem with space-bound fantasies is that only people from rich nations get to leave Earth. Poor nations won’t even enjoy those supposedly grand materials imported from asteroids or planets. It’s extremely unlikely that materials can be profitably returned to Earth, anyway, regardless of Mars’ lower gravity; it’s far cheaper to reduce and recycle what we have rather than to import stuff from outside our gravity well. Even if import became practical, such materials would be sold on the rigged Earth market, which already victimizes the poorer nations that lack the ability to print international currency; a coincidence, I’m sure. The idea that this will all somehow magically change because inspirational humans are living on another planet is rather strange. Landing humans on the Moon inspired much of the world to trust in Capitalism rather than Communism, yet there are today more people enslaved and more people displaced and dying in conflicts around the world than in 1969. If this is “winning”, I’d hate to see what losing would look like. At some point in the space-faring future of our dreams, there’s absolutely no reason to believe that Earth won’t simply consist of all the poor people that got left behind on a heating planet. Nobody’s signing up Haitians or homeless people for Mars One; no, for these well-intentioned people, an inhabited Mars would effectively become the world’s most secluded country club. Sure, it’ll be a dangerous undertaking, but the same could be said for the great white explorers dividing up Africa and South America while sending back photos of themselves standing over dead rhinos. History suggests that it’s dangerous to trust in the priorities of rich nations when it comes to these things; we tend to have weird, selfish fantasies. Screw the billions on Earth; let’s send our brightest and most valuable people to Mars. Zubrin believes that the social and technical solutions discovered on Mars will be exported back to Earth to save our civilization and planet, but this is just a grand justification for his understandable desire to explore a new world. Nobody left on Earth will care what the Martians think; few people are even willing to /talk/ to a parent that abandoned them, let alone take their advice. A Mars colony may as well not exist to the rest of us, and who’s going to stop the Western Mars colony from going to war with the Chinese Mars colony? History again suggests that Nationalism is at its most powerful in power vacuums outside of existing geographical boundaries, especially beyond the vacuum of space. We are, after all, still living in a Mercantilistic world of first come, first serve, regardless of what we claim. 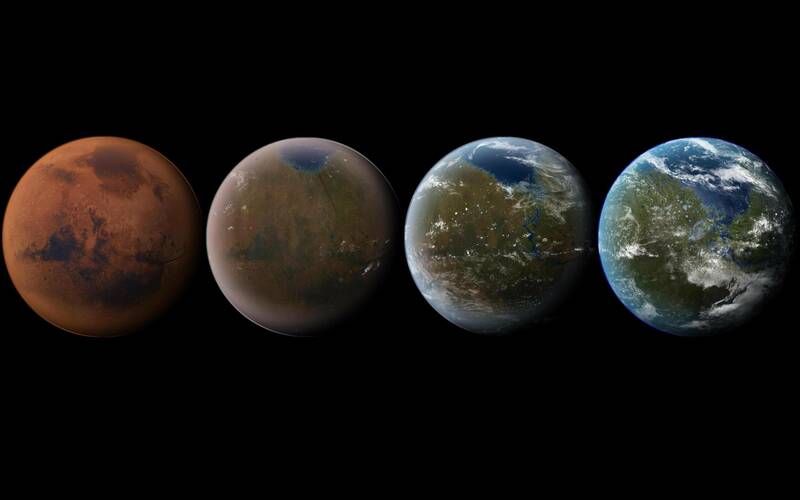 I totally support missions to Mars and think it’s a worthwhile endeavor to explore and discover, but I think the people that idealize a terraformed Mars have been smoking too many sci-fi books. This includes Elon Musk. He’s a genius, but like most of them, he’s a bit nutty ;). I don’t want to discourage his dreams, however. Humans need a few dreamers, even if they sometimes have to be caged or shot for the greater good ;).